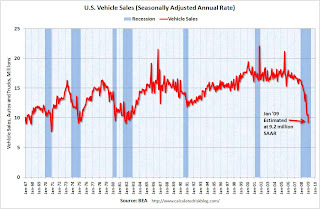 The first graph shows monthly vehicle sales (autos and trucks) as reported by the BEA at a Seasonally Adjusted Annual Rate (SAAR). Based on the sales reports today from Ford, GM, Toyota and Chrysler, it looks like vehicle sales were below 10 million units (SAAR) for the first time since the early '80s. My estimate is vehicle sales were at a 9.2 million SAAR in January. Ouch! The second cliff diving graph shows New Home Sales for the last 45 years. Sales of new one-family houses in December 2008 were at 331 thousand (SAAR). This is the lowest level ever recorded by the Census Bureau (data collection started in 1963). 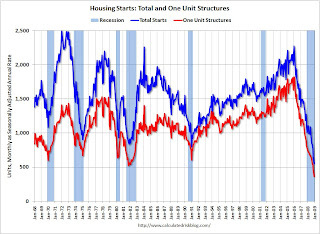 And the third graph shows total and single family housing starts since 1959. Total starts were at 550 thousand (SAAR) in December, by far the lowest level since the Census Bureau began tracking housing starts in 1959. Single-family starts were at 398 thousand in December; also the lowest level ever recorded (since 1959). Single-family permits were at 363 thousand in November, suggesting single family starts may fall even further next month! And none of this data is adjusted for changes in population. No sunshine here. But wait ... we all know this cliff diving will stop sometime, and probably not at zero. 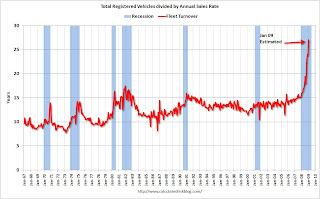 This graph shows the total number of registered vehicles in the U.S. divided by the sales rate - and gives a turnover ratio for the U.S. fleet (this doesn't tell you the age of the fleet). This suggests vehicle sales have fallen too far. And if vehicle sales just stablize, the auto companies can stop laying off workers, and the drag on GDP will stop. New home sales is a little more difficult because of the huge overhang of excess inventory that needs to be worked off. 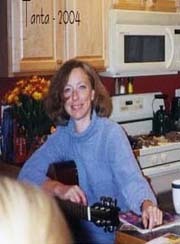 But some people will always buy new homes, and we can be pretty sure that sales won't fall another 270 thousand in 2009 (like in 2008), because that would put sales at 60 thousand SAAR in December 2009. That is not going to happen. 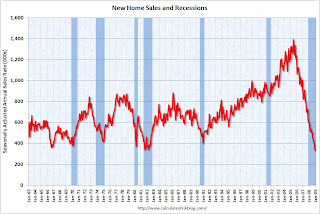 So, at the least, the pace of decline in new home sales will slow in 2009. More likely sales will find a bottom - to the surprise of many. And we know for certain that single family starts will not fall as far in 2009 as in 2008, because starts can't go negative! So, once again, the pace of decline will at least slow. And more likely starts will find a bottom too (although any rebound will be weak because of the excess inventory problem).